Golfers from around the world travel to Hilton Head each year so, it’s not surprising the island has a stunning array of accommodations. Oceanfront hotels, convention and resort centers and comfortable golf or beachfront villas abound on the island. Before you choose the accommodations for your golf getaway, it is important to understand some of the local geography. Hilton Head Island is divided into plantations or communities. The various plantations offer differing characteristics and amenities. Before choosing your accommodations base, it may be wise to consider the differences in plantations. On the Southwest end of the island is Sea Pines resort area. Sea Pines was the island's first developed area. Sea Pines is a mixture of residential and resort areas with 3 public golf courses, several tennis courts, beach, two marinas and the very popular Harbour Town shopping district. One of the finest resort destinations in the world, Palmetto Dunes Oceanfront Resort is truly a jewel in the crown of Hilton Head Island. Its 2,000 acres, nestled on three miles of sun-kissed Atlantic Ocean beachfront, provide the perfect venue for three world-class golf courses, an award-winning tennis center, and an 11-mile lagoon that invites guests in kayaks and canoes to share a pristine, natural environment with 40 species of birds and fish. Among Hilton Head oceanfront resorts, Palmetto Dunes enjoys an illustrious reputation for creating unforgettable vacation experiences. Port Royal Plantation features several historical sites. The Island's namesake Captain William Hilton first landed here in 1663. 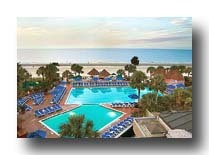 The Port Royal resort features a convention center, entertainment and restaurant. The oceanfront hotels are simply some of the best on the Atlantic Coast, offering rooms with sweeping views and first-rate service. Most of these luxurious facilities are complete resort destinations, offering fine dining, fitness centers, concierge services and other upscale amenities. Golf vacation packages are a regional specialty. There are many different “stay-and-play” packages available from local hotels, resorts and from private companies.